Ron Kern entered the profession of golf course architecture in 1986. 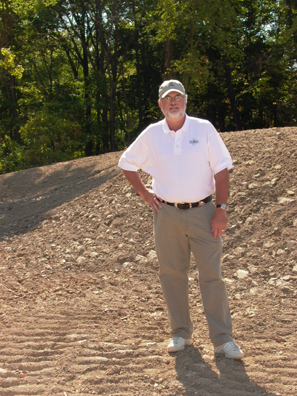 Essentially he is a third generation golf course architect as he grew up watching William Diddel and his father, Gary, develop and construct projects. Ron has played the game of golf since age 4, excelled on high school and college golf teams and still enjoys playing the game on a regular basis. Ron graduated from Purdue University with a BSCE in 1980. Ron is a student of classic golf course architecture. He believes in the spirit of the design philosophies of the golden age golf course architects. His major influences are Donald Ross, James Braid, George Thomas, Dr. Alister Mackenzie, A.W. Tillinghast, William Diddel and his father, Gary. •To respect the existing character of the land and create an end product that emphasizes its features. •To provide a comprehensive design package from a conceptual routing to detailed construction documents. •To generate a design specifically tailored to meet the client’s needs and budget requirements. •To present a final product that exceeds the client’s expectations. •To provide the client with a design that meets the needs of the market thereby ensuring a successful golf operation.